Day 1.) Arrive At Bangkok, after completion of Visa Process and Immigration, Transfer to Pattaya Hotel. Check in at hotel at 02:00 PM. Day 2.) After Breakfast, Full day Coral Island Trip with Lunch and evening back to Pattaya. Evening at Leisure. Day 3.) After Breakfast, Check out from Pattaya Hotel and Transfers to Bangkok Hotel, En route Bangkok City Tour with Gems Gallery and Afternoon Check in at Bangkok Hotel. Day 4.) After Breakfast, Day at Shopping and Day at Leisure. Good News is: Free on-arrival Visa ( VoA ) #Free for Thailand until April 30th, 2019 for India and some other countries. All Airport and Inter hotel Transfers on Pvt Basis. 2 Nights at Bangkok hotel. 2 nights at Pattaya Hotel. Travel Talks on Pool Side. Note: This is Exclusive for Solo Travelers! Note: As we have very limited seats. Registration first come first basis. 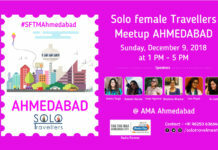 You will get entry at the Meet & Trip only with the invitation email. (1) ** Timings are subject to change without prior notice. (2) All the rates are applicable for Indian Nationals only. (3) International hotel check in is at 1400 hrs and checkout is at 1200 hrs. (4) Early check in and late check out subject to availability and consent of the hotel. (5) All hotels in Thailand will ask for a deposit or credit card impression at the time of check-in. The deposit amount varies from hotel to hotel. (6) For all transfers and tours, please wait at the Bell Captain or Concierge Counter at least 10 minutes before scheduled pick-up time. Please do not wait in your room or the Coffee Shop. (7) Due to heavy traffic sometimes your pick-up may be delayed by a few minutes. (9) services missed. You have to pay directly to re-book the tour. For all transfers the baggage allowed is similar to permissible limit by airline. We will not be able to accommodate any bulky pieces of luggage purchased locally. (10) Many a times it has been observed that the passengers start shopping at duty free on arrival and due to this they miss their transfer. In such cases the passengers will have to pay for the next available transfer. (11) If the passenger has the visa, it takes a maximum of 30-45 minutes to clear the immigration and customs. If you are taking Visa on Arrival, we must be pre-informed. (12) Please check all the vouchers given to you on arrival in Thailand. Please spare a few minutes and go through them thoroughly. In case you find any discrepancies in any services related to Hotels, sightseeing, transfers, meals, service dates & timings please immediately call the local Thailand numbers mentioned on the voucher for rectification. In case we do not receive any call we will assume that all documents provided to you are correct and as per your program. (13) We will not be liable for any claims or expenses arising from circumstances beyond our control such as accidents, injuries, delayed or cancelled flights & acts or forces of nature. Client will have to bear the charges of cancellation (if charged by the hotel & other suppliers) arising due to delayed or cancelled flights & acts or forces of nature. (14) By accepting this voucher you are confirming that you have carefully read all the information provided in this voucher. (15) Solo Traveller Is Not Responsible for loss of any of your belongings. (Passport, Money, personal belongings etc).It is oneself responsibility to take care of your belongings. (16) Solo Travellers doesn’t promote alcohol consumption, any Travelers found harrassing or bothering fellow travelers will not be tolerated. (17) Any crime occurred by you on Thailand Trip and if found offensive by Thai Government will be oneself responsible for it. Solo Traveller doesn’t Support such activities.